In the video i used a very simple T-shirt model. 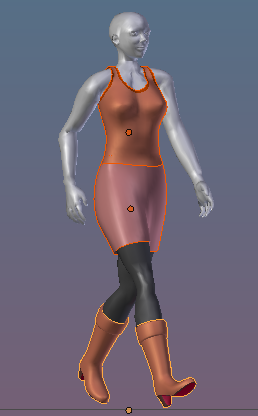 This model is actually a cut-out of the Second Life upper body mesh. This demo_model provided by Machinimatrix is a derivative from the Secondlife character, so the license of the Secondlife character applies. You have the permission to upload this model and any derivatives to SL. Meshes have one nasty problem: They can not be fully adjusted to the user’s shape. When you weight only to the classic deforming bones (mBones) then actually only a few of the Appearance sliders (the bone length changing sliders) can be used. Avastar basically supports the creation of animatable Models (Avatars&attachments) and the creation of animations. Therefore the tool adds various functions and user interface elements to Blender. 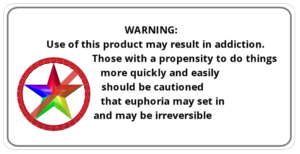 The full functionality of Avastar can be a bit overwhelming on first sight. You should be prepared to spend some time and patience to get it all working nicely for your projects. What does this Document provide? We want to take the skirt from the preceding Create an Attachment guide and convert it into a fitted mesh skirt. We will mostly use the Fitted Mesh tools provided by Avastar 1.6. We expect that you have basic knowledge about Blender. The concepts of fitted mesh are nothing unique to Second Life. In fact Fitted Mesh is absolutely standard Skeletal Animation. The problem with Fitted Mesh is only its name (honestly). Some people believe that fitted mesh allows your mesh avatars to be adjusted perfectly to the SL system Avatar. But this is entirely not true. Fitted mesh does not fit exactly to anything, and especially fitted mesh does not fit to the system Avatar at all. 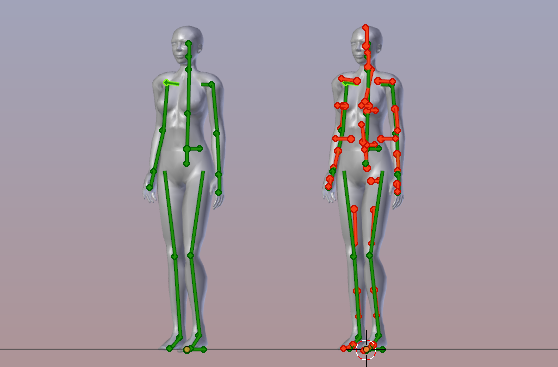 In fact Fitted Mesh is based on Skeletal Animation, while the SL Avatar shapes are mostly based on Morph Shapes. The 2 concepts (Skeletal Animation and Morph shapes) are not comparable and thus they do not (actually they can not) create the same results. If you are lucky you can manage to create something that creates similar results, but never a perfect match for all Appearance Slider values! The Avastar Tools for Fitted Mesh only work when your mesh is already weighted! The tools need existing weight maps on which they can operate. In general we recommend that the meshes are already weighted reasonably well for the classic bone set. Side note: Actually you can start with no weights at all, but then the Fitting panel does no longer work smooth and easy. I will explain the issue in more detail further down. Some people believe strongly that Fitted Mesh only uses the cBones (Collision Volume Bones), while Classic Mesh is a synonym for only weighting to the mBones (Deforming Bones). But this is not entirely true. Fitted Mesh weighting allows you to mix cBones and mBones. In fact our tools does just that to achieve better results. No, you won’t get there in one afternoon! This is a brief description of the concept that we used to implement support for Fitted Mesh (The Fitting Panel). We have pairs of (mBone, CollisionVolume) like for example (mPelvis,Pelvis), (mTorso,Torso) etc. For those bones the sum of the weights in both weightmaps define how the bone pair influences the mesh during rotation and translation. While the weight on the Collision volume alone define the influence of the appearance sliders (scaling). So you can distribute your weighting between the mBone and its paired collision volume without changing how the mesh behaves during animation. While the more weight you put on the Collision Volume the more influence you give to the appearance sliders. Note: By distribute your weighting i mean that for each vertex the sum of the weights on the mbone and its paired Collision Volume does not change. 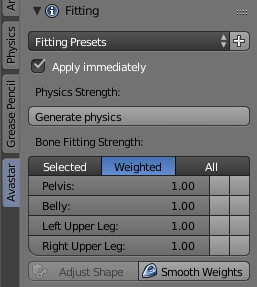 So you can distribute your weighting between those mBones and any or all of their related Collision Volume Bones without changing how the mesh behaves during animation. While again the more weight you put on the Collision Volume the more influence you give to the appearance sliders. You just take your weight paint brushes and paint until your mesh behaves about right. This works for the simple bone/volume bone pairs (see above) without issues for large portions of your meshes. You only get trouble near the bone joints where you need to take special care about how to distribute the weights among the related bones. This limitation gives you headache when you use all fitted mesh bones on your mesh. We will use a very simple skirt for this tutorial. (The video above uses a different mesh) This skirt is already weighted to the classic mBones and it contains a simple walk animation for scrubbing the timeline. The above demo_model provided by Machinimatrix is licensed under a Creative Commons Attribution 4.0 International License. For Second Life Users: We explicitly grant the permission to upload derived material to SL. The skirt is available in animated_skirt.blend. We use the very simple skirt model from the Create an attachment tutorial to demonstrate the basics of fitted Mesh. This skirt is already weighted to the classic mBones and it is rigged to a default Avastar character. We also added a simple walk animation (which was made with the Sparkles Add-on ). So the blend file is “ready for take off” provided you have Avastar 2 installed. We highly recommend that you first work your way through the Create an Attachment reference guide before you step further. 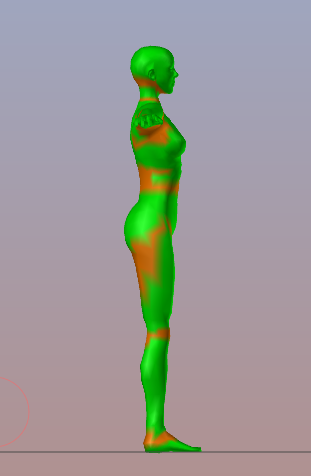 Select the Skirt inWeight Paint mode. Open the Avastar Tab in the Tool Shelf. In the Rig Display Panel select the Pose Preset. Optionally set the Rig display type to Stick. Enable the visibility only for the Deform Bones. And set the Display filter to “Map”. Note: This is just my setup. You are free to use your own setup of course. But when you step through this document for the first time, then we strongly recommend to use the settings as indicated above. 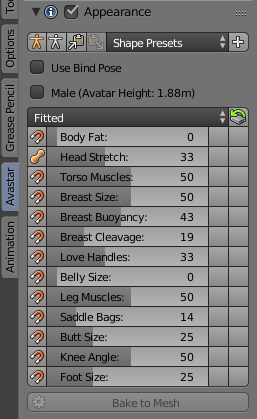 By default only the 26 SL Base Bones of Avastar’s 136 Bones are enabled to use weight maps. All other bones are simply ignored by the Mesh attachments! 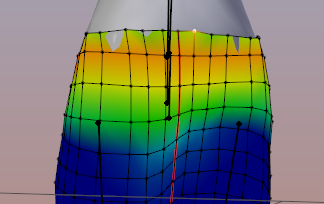 However Fitted mesh also uses the Collision Volume Bones for deforming. Avastar normally ensures automatically that the Collision Volume Bones are enabled as Deform Bones when needed. Caveat: There is no visual feedback for what happens. This is a known issue on our list of improvements. Open the Appearance Panel in the Tool Shelf and select the Fitted Section (see image). Now you can see all Appearance Sliders (13 in total) which are used by the Fitted Mesh System. Please keep the Appearance Panel open as we will use it frequently from now on. Tip: Please save your Blend file after you finished the preparations and keep this file as reference. 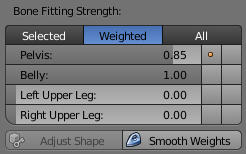 Then you can always step back to a clean setup should you ever have messed up the weight maps of your meshes. Should you ever need to open a ticket, then we probably will ask you to also send us this initial setup blend file. The Fitting panel contains all the tools that we have created to support Fitted mesh in Avastar 2. The video aside gives you a brief overview. However i recommend that you also take a look at the following chapter about the Basics of Fitted mesh. This will certainly help you to understand how the tools operate, and how to use them efficiently. When we step into fitted mesh the situation gets a bit more complicated. Technically Fitted mesh is nothing special. It just makes use of a subset of the Skeleton, namely the set of Collision Volume Bones, where each Collision Volume Bone is clamped to a corresponding classic bone. Thus building tightly coupled Bone Pairs. Due to the clamping the collision Volume always moves and rotates along with the bone to which it is clamped. With other words each bone pair [Collision Volume + Classic Bone] can be seen as one unbreakable unit. Lets name such a bone pair a FittingBone consisting of an mBone (a classical bone) and a cBone (a collision Volume). When we look at classic Weighting then we only deal with the classic mBones. The cBones are completely ignored by the animation system and things are rather easy and well organized (left side of image). For Fitted Mesh many users think they just need to replace the classic mBone weighting by the new cBone weighting, thus only use the cBones for fitted mesh. But this is not true. In general we have to deal with all cBones and all mBones at the same time when we make fitted mesh (right side of image)! to get a pure classic weighting. the 2 bones in any way you like. In any case it is the weight sum of the Collision Volume and the corresponding classic Bone within a FittingBone pair that affects the animation, nothing else! But wait, when you add weight to a collision Volume, then the weight sum on your vertices raises above 1.0 (because you added weight) ops… Well, Blender is a bit clever here (and also a bit confusing for the user), it allows you to create weight sums > 1. But then it internally corrects the numbers by normalizing them before using them. Normalizing enforces that the weight sum is 1.0 again. Well, you have added weight to the collision volume bone, right? But the weight sum must be kept at 1. Hence this added weight must have been taken away from somewhere… So by adding weight to the cBone we reduce the weight on all other bones. This is not an issue where you only have one single weight (the red zones in the images above). But wherever you already had 2 or more weights on classic bones, adding weight to a corresponding Collision volume most probably destroys your weights on the classic bones. And unfortunately this always happens near the joints. The Collision Volume Bones are used to add volume to your mesh. That is, the cBones provide a scale vector to make your mesh bigger or smaller depending on the amount of weight on the CollisionVolume Bone. However you never “see” this vector anywhere. But you modify its value by using the Appearance Sliders. And as a result your mesh blows up or shrinks whenever a vertex is weighted to a collision volume bone AND the sliders are not in the neutral state. Caveat: But all of this does not happen when your armature is in its default Shape (neutral shape) simply because there the scale vector is neutral. And then move the appearance sliders of interest out of the neutral setting. otherwise you can not see any change in your fitted mesh! As a consequence a fitted mesh character does in general use 4 weights near the joints and 2 weights anywhere else. Hint: The Fitting Panel is best used together with the Appearance panel. You should have both panels open and visible in the Tool Shelf. The settings controls which of the Fitting Bone sliders are shown in the slider list below the 3 filter buttons (see image). By default we display only the weighted Fitting Bones to avoid clutter on the display. Attention: In any case for each vertex the sum of the weights on the cBone and the mBone is kept unchanged. This actually implies that if a vertex is not weighted to a Fitting Bone, then moving the Fitting Slider will not generate any weight! 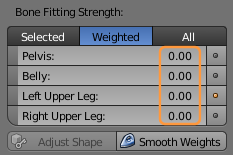 However you can add weight to any vertex manually (by using the weight editor or a brush) and as soon as you do that, the added weight can also be distributed with the Fitting Sliders. Remind that mBones are shown in Blue, while cBones are shown in orange. A Fitting Bone is Selected when either its mBone or its cBone is selected. A Fitting Bone is Weighted when either its mBone or its cBone is weighted. 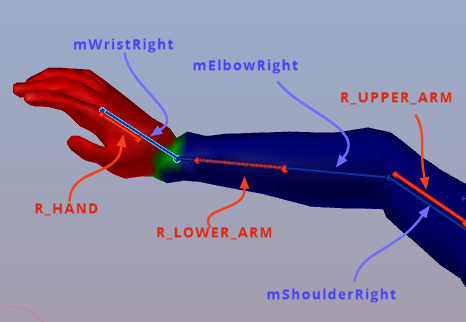 Note: If both bones of a Fitting Bone are weighted, then you see them both in the 3D View. Please refer to the Preparation section above to see how to customize the Bone Display. 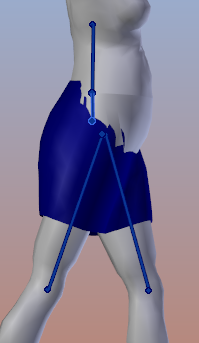 Thus only the mBones are weighted, thus the mesh contains weight maps only for the classic mBones. You can verify this by opening the Mesh Data Properties Window and inspect the Vertex Groups. And indeed we can see the 4 Vertex Groups for the 4 classic mBones. Please step to the top of the Fitting Panel now make sure the option Apply Immediately is enabled. This ensures that our next changes become fully interactive. 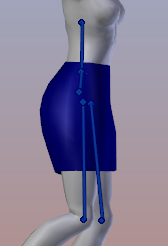 Now lets move the Pelvis Fitting Slider a bit to the right. You see the orange PELVIS Bone appears in the 3D View as well. And also a new Vertex Group for the PELVIS bone has been automatically created in the Data Properties window. 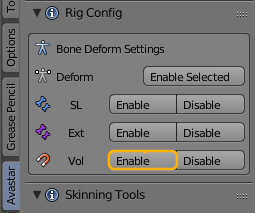 Tip: If you can not see the Collision Volumes appearing when you move the fitting sliders, then please check further up in the chapter Configure the Deform Bones that the Collision Volume Bones are enabled as Deform Bones. For the technician: The weight values are split up between the PELVIS bone and the mPelvis bone. The Slider sets the fraction of weight that gets transferred from the mBone to the cBone. So when the slider is at 0.0 then the fraction of weight on the cBone becomes 0. While when the slider is set to 1.0 then all weight has been moved over from the mBone to the cBone. The Fitting Sliders never add extra weight. They only change the weight distribution of their associated mBone/cBone pair! Side note: When a Fitting slider is set to 0.5 then all weights are equally split up between the mBone and the cBone. your Appearance sliders are all in their default position (this is our issue here). You must move the Appearance Sliders out of their default positions when you want to see the influence of the fitting sliders on the Mesh Shape! You forgot to enable the Apply Immediately option in the Fitting Panel. Enable this option and try again. Your mesh is neither weighted to the cBone nor to the mBone of a Fitting Bone. In that case there is no weight to distribute! Hence the Fitting Bone slider has no effect at all. Lets now do some practical work with the dress. Please open the Appearance Panel (Torso Section) and move the Slider for the Belly Size to 50 (midway). You see on the image how the skirt sinks into the stomach (or how the stomach grows above the skirt). 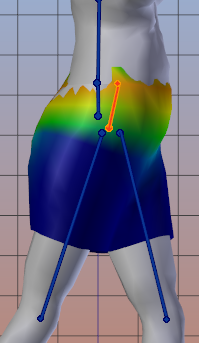 Now step back into the Fitting Panel and move the Pelvis Fitting Slider gradually towards its maximum value. You see the belly growing with the Fitting Slider changes! 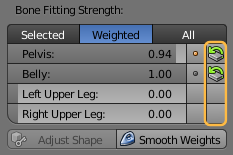 When the slider Value of the Pelvis Fitting Slider is close to 0.85 we see the mesh has changed like in the image aside. This is not perfect, but it is much better than it was before! 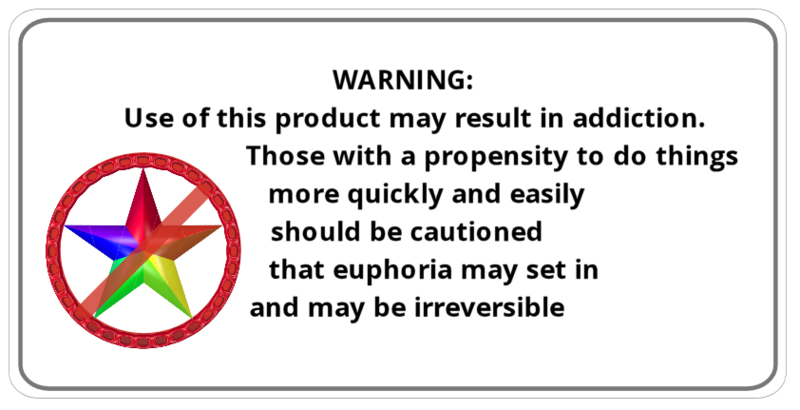 You will end up with a slightly improved shape as shown in the image aside. However you still see issues on the side and on the back of the skirt where the original Avatar mesh pokes through. Luckily the fitting Sliders also work on vertex selections in Edit mode. All that you need to do is to set your mesh to edit mode. Now you can go ahead and select any subset of verts and then use the fitting sliders to improve the vertex locations of the selected verts. You can even select only one single vertex if you like. As soon as you begin using Fitting sliders in Edit mode, you notice that an additional icon appears on the right most column in the Fitting Sliders panel. When you click on this icon, then all weight edits that you have done in edit mode will be reset. 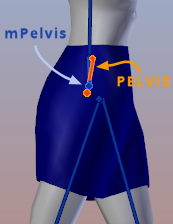 The revert icon on the right most column of Pelvis and Belly indicates edited weights. Whenever the fitting slider values have been changed in edit mode, and when you switch back to weight paint mode, then moving the sliders may result in a change of the weight distribution of the entire mesh. This is a known inconvenience which we hopefully can resolve soon. Current Workaround: Either readjust the Fitting slider or do not touch the fitting sliders in Weight paint mode after you have adjusted the weights in edit mode. Some areas of your mesh might suffer from poke through regardless how you distribute the the weights. In these areas your weights are not able to fit your mesh to the underlying Avatar mesh. However you can use a few strategies to master poke through issues. We will not get deeper into this topic here. We prepare a separate document for this. I have introduced the principles of fitted mesh and the Avastar Fitted Mesh tools (i.e. the Fitting Panel). I have shown how you can work with the Fitting panel in Weight Paint Mode and in Edit mode. From here on you can begin to experiment. Please be aware that nothing here is set in stone. Especially our workflow is not the only way how you can do fitted mesh. However i believe this is a good way to get you started.